When we decided to start researching single use coffee makers, the Keurig branded machines popped up a lot. Versatile and reliable, the brand really is a leader in this market, but naturally, they have price tags to reflect that. So imagine our delight when we found the Mr Coffee ﻿BVMC-KG6-001. Mr Coffee teamed up with Keurig to bring you this range. They use Keurig technology and their K-cup pods, but at a much lower price. Of course, we had to investigate and see if Mr Coffee could really pull this off! What Features Does the Mr Coffee Machine Have? Who is the Mr Coffee Machine Ideal for? Who is the Mr Coffee Machine Not So Good for? You can add an extended warranty of three or four years for a small additional fee. That’s all there is to it! You will have your coffee in less than one minute. The machine really is that easy to use, and you get a great tasting cup of coffee, tea or hot chocolate every time. You can even make different drinks one after the other without having to mess about cleaning the nozzle each time. Travel mugs easily fit into the space provided once the drip tray is removed, which is great if you like your coffee on the go, and you will save so much money by replacing your coffee shop morning coffee with a home brewed cup. The touch buttons are all easy to identify and use. You can choose from three cup sizes – choose the smallest for the most intense flavour and so on. Experiment a bit with the different drinks options and the strength until you find your perfect flavour! This machine is ideal for beginners who want a machine that does the job without needing much user input. It’s a great machine for anyone who wants the innovation that comes with a Keurig machine but don’t have the budget to spring for one. The fast brewing and large water tank makes it the ideal machine for anyone with a larger family or who entertains a lot as there isn’t a lot of waiting around to make multiple cups in one go. Even if everyone wants something different! The machine isn’t suitable for anyone who doesn’t like K-cup capsules as they are the recommended capsules to use. Of course, you can buy the reusable K-cup and use your own coffee, but as we mentioned above, if you want to do this, there are many cheaper options out there that use this method. The Mr Coffee BVMC-KG6-001 certainly does live up to its claim of bringing you Keurig inspired technology at a much cheaper price. 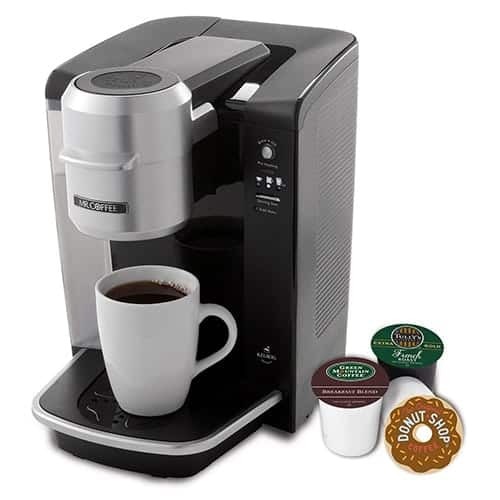 It is a great all round choice and definitely worth a go if you were considered a Keurig for your next single serve coffee maker.